Planting a native tree is a powerful act that directly benefits local wildlife, moderates ground temperature, and helps remove carbon dioxide from the atmosphere. Since the dawn of agriculture, people have been cutting trees and replacing forests with farmland. More recently, sprawling urban centers have displaced millions of acres of woodland and, here in Maine, our forested landscape has been radically altered over the past few hundred years despite its remaining beauty. With a warming climate and increased urbanization, planting native trees, especially in our local neighborhoods, is an action that each of us can do to counter the negative effects of climate change. While all plants are impressive (after all, the process of photosynthesis is the reason that you and I are able to exist! ), trees are perhaps the most amazing because of their size, beauty, and stature. Trees rise above all other plants, their trunks and leafy branches reaching skyward, creating a tremendous amount of habitat for a multitude of animal species. Woodlands create a protective canopy above the earth that regulates temperature, moisture, and nutrient cycles. Trees also store carbon in their mass, capture and recycle rainwater, and shade and protect the earth with their roots and leaf litter. It is easy to feel despondent at the loss of forests and natural landscapes worldwide – what can one person do? But if each of us can plant a tree, we are taking one step forward in reversing the impact of deforestation. 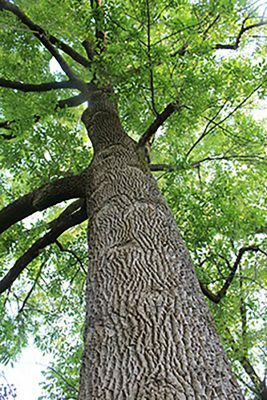 A tree may just be one component of a forest, but even a single native tree will attract a large diversity of other creatures and provide year-round interest and beauty when most of the ground level vegetation goes dormant. 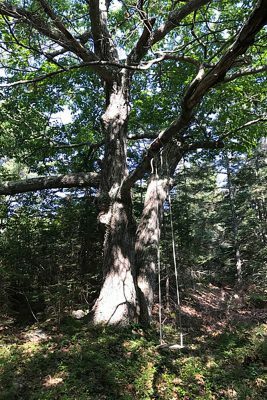 Below is list of some of the canopy trees native to Maine that are deserving of space in our landscape. Imagine the collective impact if each of us could plant one of these trees in our yard, street, school, business, parking lot, or neighborhood park. 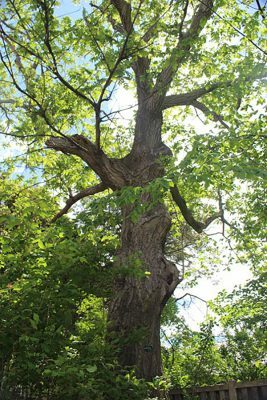 For in-depth information and photos of these trees, see Forest Trees of Maine. Species marked with asterisk (*) are tolerant of tough urban and roadside conditions such as compacted soil and salt spray and are excellent candidates for neighborhood street trees. 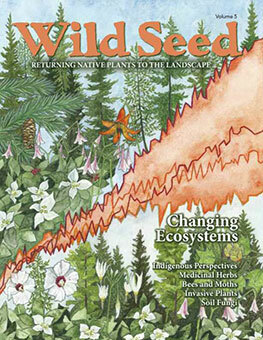 Other species will thrive in yards and large green spaces. A few of the species listed above are currently being attacked by invasive pests (insect or fungus). Most species are eventually able to overcome pests as long as there is enough genetic diversity within the population. It is important to keep sowing seeds of these species and remain hopeful that resistant individuals will reproduce to carry that species into the future. Before choosing a tree for your location, take the time to determine your site conditions and match them to the tree’s requirements. To create optimum soil conditions for forest species, add a thick mulch of composted leaves (often available from your town recycling center) or aged hardwood bark. This will help bring back the microorganisms in the soil and hold moisture. In the fall, leave your leaves and resist the urge to rake them away, as this is how nutrients are recycled in the forest and many species of wildlife overwinter in the leaf litter. Also keep in mind that smaller trees are much easier to plant than larger ones – younger trees establish themselves more quickly and are much less expensive. Within a couple of years, they will surpass a larger transplanted specimen. Trees can be planted as soon as the ground thaws- the earlier the better to take advantage of spring rains and cooler temperatures for root growth. Lastly, if you want to plant a street tree in front of your house, check with your local city or town arborist. 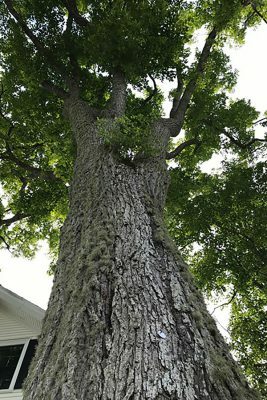 Offer to plant it yourself, or some cities (like Portland) will help you with street tree planting – just make sure you ask for a native tree and help to care for the tree after it is planted. For detailed instruction on how to plant a tree and data on the environmental benefits of trees and forests, see the website of the Arbor Day Foundation. When choosing a tree at a nursery, look for trees grown from seed instead of cloned forms (for example: if you want to plant red maple, choose Acer rubrum instead of the cultivar Acer rubrum “Crimson King”). Clones are all from one individual and lack genetic diversity, the basis of resilience (resistance to heat, cold, drought, pollution, or pests) in a species. Winter is a great time of year to let your local nursery know what native plants you want to purchase. Knowledgeable staff are working on their spring orders and can let you know what they plan to have in stock and may even be willing to make a special order for you. 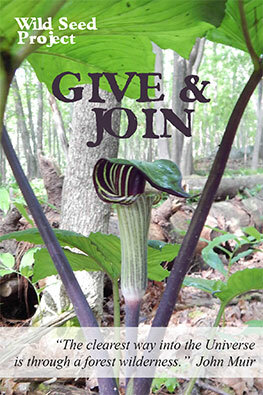 Also, look for native plant sales in the spring – many conservation and gardening organizations host annual events. 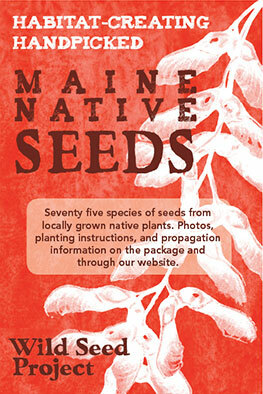 We post upcoming native plant sales that we are aware of on the Wild Seed Project Facebook page. Trees can be purchased in pots, ball and burlap (dug with soil and wrapped in cloth), or bare-root (freshly dug from the ground without soil). Winter is the time to order your bare root trees. Two good mail order sources of bare root native trees are FEDCO Trees and Prairie Moon Nursery. Many trees are easy to grow from seed—read our blog post on this topic. Also, here are some ideas for small native trees and ideas on planting under the shade of trees. Make it one of your New Year’s resolutions to go forth and plant at least one tree in 2018!